ArchNews gives an overview of changes to the Gateway Mall in St. Louis. 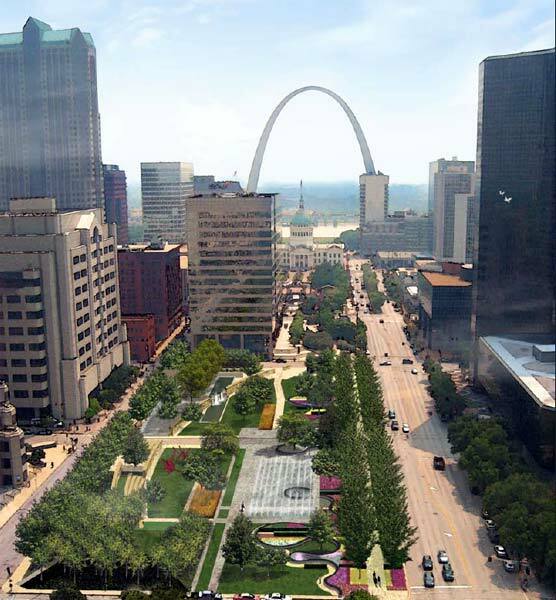 From an urban planning standpoint, sometimes a garden is not just a garden – especially in St. Louis. City planners see Citygarden, which opens tomorrow, July 1, as the first step in fulfilling a nearly century-old dream in St. Louis – creating a thriving civic space along the Gateway Mall, the 1.1 mile-long ribbon of grass and trees that runs east to west from the grounds of Eero Saarinen’s iconic 1965 Gateway Arch and Old Courthouse to Union Station. The mall “has never fully realized its potential,” acknowledges Deputy Mayor for Development Barbara Geisman. Instead of serving as a bridge between the north and south sides of downtown, it has acted more as a barrier. What were two square blocks of vacant lawn space on the largely uninterrupted stretch of city-owned green space bordered by office and government buildings, is now a 2.9-acre urban oasis of sculpture, nature, stone, and water. The project stems from a partnership between the city and the local Gateway Foundation, which has provided funding through $25-$30 million for design and construction and other maintenance. What a great idea to create a public space in a place that seems to be easily accessible to all. Not only this, the trees will help reduce carbon levels. This, as well as the example of the free-way molded into a park environment, should taken seriously by all in order to create more longterm and sustainable living environments. The Mall has nothing to do with uniting or dividing downtown slouis. That would have been up to the developers of both sides of the Mall, with city guidance and inspiration, which has been totally abandoned. The Mall was designed as a grand avenue between the Arch and Union Station, a magnificent horizen line and park respite for downtown. A full illustrative spread on what it was intended to be was published in the post-dispatch Sunday Pictures Section in the late 50’s or early 60’s [by the way; the Arch was designed in the late 1940’s, NOT 1965]. It was badly mutilated by the inane city “fathers” who allowed construction of an office building right in the middle of it, a lunatic decision which has forever ruined the Mall as a place and a concept, regardless of what is done with a few other blocks of it. The glaring intrusion of that horrid building into the Mall, as vividly displayed in your picture, exposes slouis as a podunk town. Even without that building, lining the Mall with inhumane garages, as the city has also allowed [and as your picture shows], has completely deadened what should have been a unique, spectacular and elegiac feature of the city. I have problems with seeing your blog clearly via the most recent release of Opera. It’s fine in Explorer 7 and Firefox though.Hope you have a great day.